Most folks prepare for a 1200K by riding a brevet series and a bunch of centuries. Kelly Smith decided that was not quite enough. 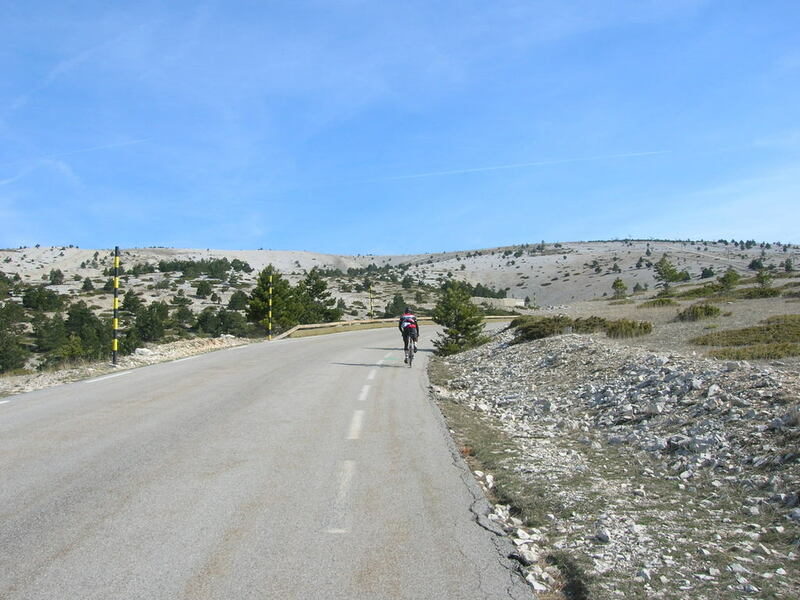 He flew to France to bag a permanent on the Monster of Provence, the eerie Mont Ventoux. Kelly gives us the randonneur view of the infamous Tour de France climb via his story. Probably all of you who didn’t run away quickly have heard that my daughter Maggie is spending a semester abroad in Aix en Provence, France. My wife and I of course made plans to visit her. 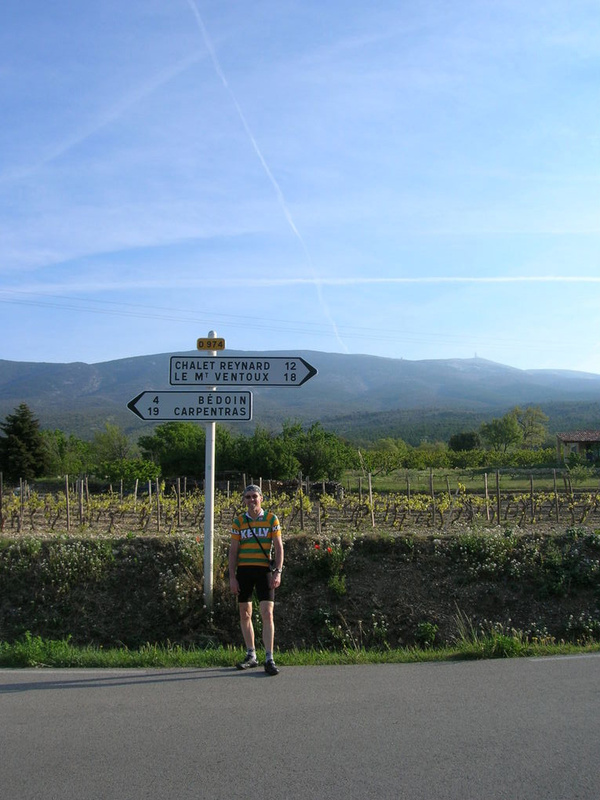 To a cyclist, Provence means Mont Ventoux. A couple years ago my oldest cycling buddy Troy Swackhammer passed me an article about the “Club des Cinglés du Mont-Ventoux”. 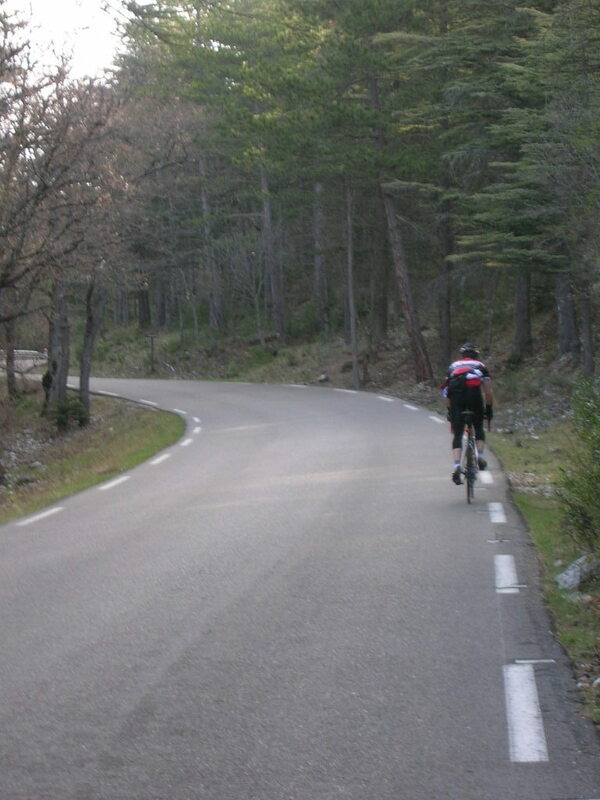 It’s a permanent brevet consisting of climbing all three paved routes up the mountain. Another version adds an unpaved forest road, but we decided we weren’t that nuts! Troy and his wife Row decided to come for a week and we started planning for the attempt. We flew into Paris and spent two wonderful days walking the streets of the center city. The weather was great and we had a fantastic time, but perhaps it wasn’t the best final prep for a tough ride. With the flight and then early train we lost a night and a half sleep, arriving in Aix pretty much zombies. All the walking gave us both lead legs. Now that I think about it basically like the second day of a brevet! After finding our hotel (a tiny one on one of Aix’s narrow medieval streets) and having lunch, Troy and I headed out in the rental for Bedoin. Fans of the Tour may recognize that as the beginning of the climb the pro’s use. The drive was one of those things that are funny later, at the time not so much. 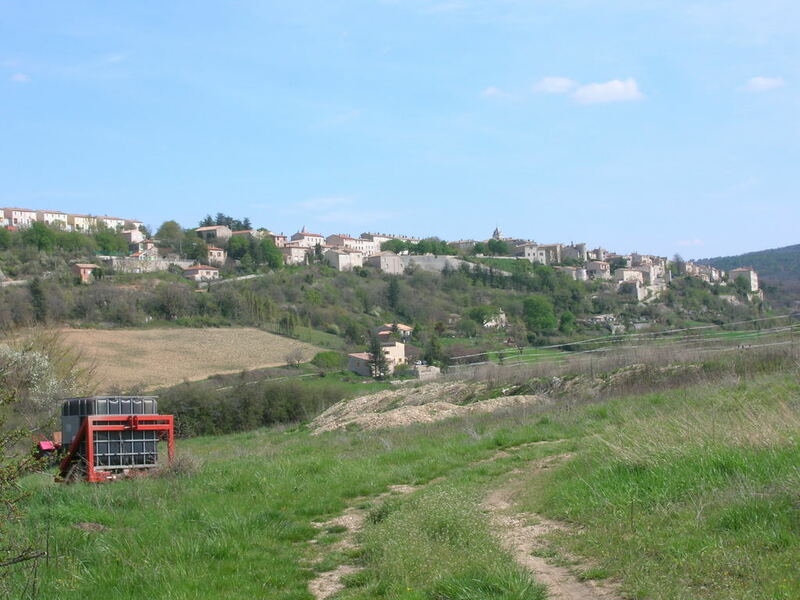 We started by getting lost and heading south to Marseille, exactly the wrong way, then when we reached Bedoin I couldn’t find the name and address of the gite (French B&B). Despite our foggy brains we found the place with the help of friendly locals, and headed into town for dinner. We were looking over the menu at an interesting place when a passing local stopped and gave it a glowing recommendation, “you’ve eaten here?” I asked. “I own it,” she replied. Turned out to be fun and as good as she said. After we went back to the gite and built up our bikes. My buddy also has a Dahon bike that uses the Ritchey Breakaway system and they always attract interest. The grandfather stopped by to inquire and we tried to explain our plans. He was satisfactorily impressed; French people always seem to appreciate cycling even if they don’t ride themselves. In the morning we were starting before breakfast was served, but the hostess insisted we have coffee. She also stamped our brevet card to start our adventure. This was a point I had been worried about, would business people understand my brevet card? If not it would be unlikely I could explain! As it turned out at each stop folks recognized what I needed as soon as the card was presented. Apparently every business has a stamp with their logo and is accustomed to signing brevet cards. 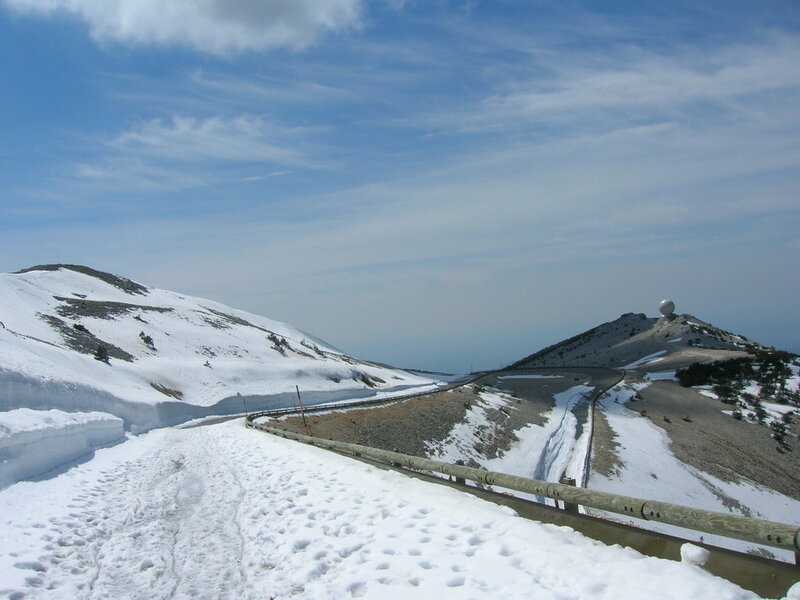 A bigger concern had been the weather: April could see snow or Mistral wind on the mountain, let alone cold and rain. Our luck couldn’t have been better. The day was clear and comfortable, with a high of 80 degrees at the base. The climb is 23k averaging 7.2%, but the last 16k averages close to 10%. Still, it is a pretty steady climb and didn’t feel too bad at a touring pace. About half way up we were passed by a pair of fellows in matching race kit. They were steaming along pretty well, half again our pace. It would be cool to try it sometime as fast as possible, but I was concentrating on saving my strength for the long day. A strange sight near the middle of the climb are trimmed boxwoods along the side of the road! No explanation why, but there were quite a few along a stretch in the woods, about two feet tall and neatly squared off. The road is through forest for the first 10 miles, then quickly transitions to the famous ‘moonscape’. The last two miles are entirely open, crossing the broken limestone rubble. We passed a large group of mountain bikers heading out on trails marked by snow poles across the open scree. It looked like a scary place to ride, seems you’d be bound to fall on the loose stone and when you do it’d be sure to cut you up. Nearing the top we stopped to fix a flat. 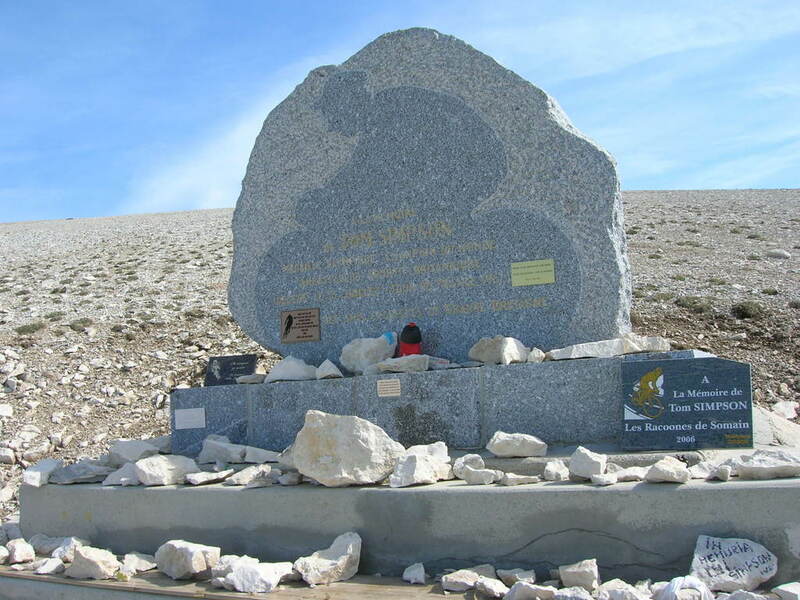 When we started up again I almost missed the famous monument to Tom Simpson, who collapsed and died in the ’67 Tour de France (a fact just as well left out when telling non-riding spouses about the mountain). His last words should be every cyclist’s motto: put me back on the damn bike! We pressed on and were soon at the famous summit antenna! From here there is a very satisfying view of what you just climbed. 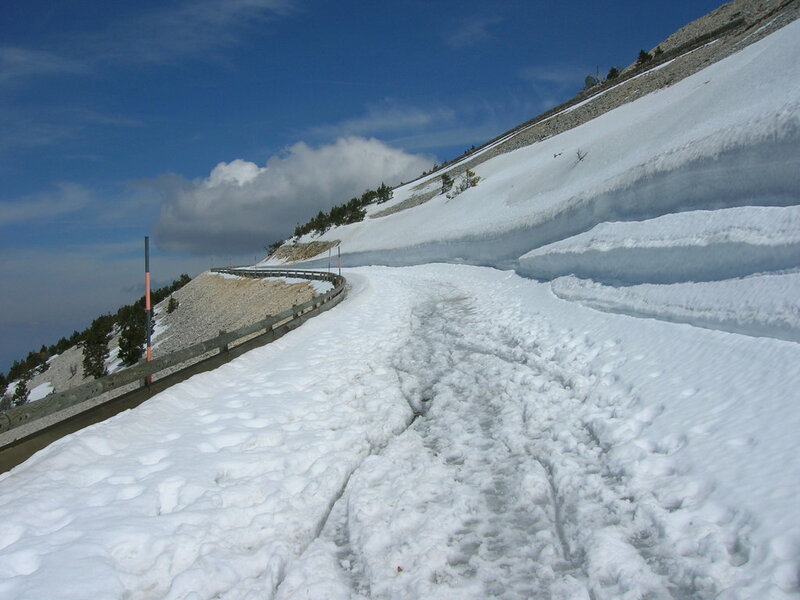 We’d seen several signs stating that the Col du Mont Ventoux was closed, but open to the summit. I didn’t understand what that meant, since the road goes right over the summit. Well, soon as we began the descent to the second town, Malaucene, we saw what ‘col ferme’ meant: SNOW. This was fairly intimidating. We couldn’t tell how far it went, and the road below that hairpin looked too steep to walk a bike in the ice. We met another fellow at the summit doing the same ride and he acted like it was no big deal, so we began stumbling through it. About here I met a hiker who told me there was only about a kilometer of it to walk, which was not too bad. I was glad to be wearing my mountain bike shoes. Still, it delayed us quite a bit. The road was closed to cars for a couple more miles, but littered with debris that made me very cautious. This route is described as easier than the one from Bedoin, but as we passed sign after sign describing 10% and 12% drops, it didn’t seem like it would be an easy climb. I met Troy in Malaucene, a pretty town with a lot of cafes, restaurants, and sports shops, including bike rentals. 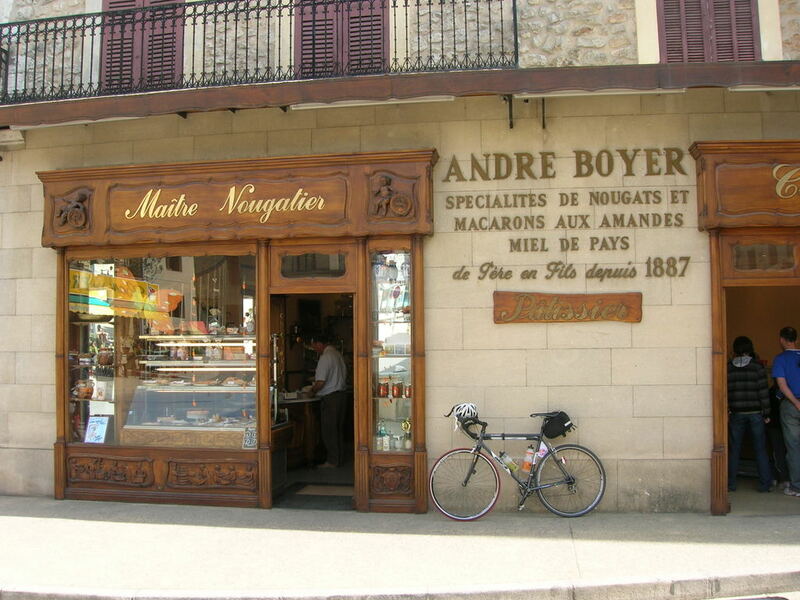 We fueled up at a nice little boulangerie (goat cheese roll, yum) and headed out for the second climb. As I feared the, climb seemed harder that the first, there are 3 stretches of 10% and two of 12%. Cool features of these roads are the little milestones or kilometer posts. On the mountain they give elevation instead of distance, so you can track your progress, which may or may not be a good thing. Saw a strange sight on the climb: masses of caterpillars that looked like our tent caterpillars, crawling up the road nose to tail. One group was about six feet long! As I got closer to the top I realized you could just make out the Alps to the north. The craziest thing I saw had to be three fellows in black leather and full face helmets descending the mountain on skateboards! The boards were regular size, maybe three feet long, with wheels sticking out to the sides. If anyone knows how you slow down or stop one of those please tell me. Of course we had to hike back through the snow to reach the top, where I was greeted by a group of British tourists who were tremendously amused by this. The breeze was kicking up a little by now (after 2) and though warmer than I expected it was not comfortable standing around. 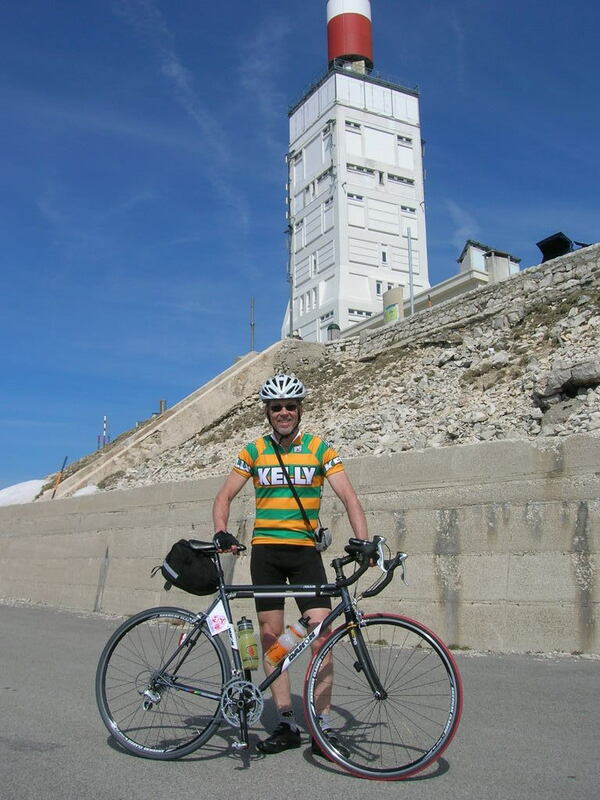 By now the gift shop at the base of the famous antennae was open and I was able to buy a coveted Mont Ventoux jersey! I had a Clif Bar and a Coke then met Troy. Unfortunately he’d had problems with leg cramps and decided 2 climbs were enough. I gave him the keys to the rental car and headed down the mountain towards Sault. This town is east of Ventoux and the countryside is completely different. Instead of vineyards and olive groves there are lavender fields. Nearly every farm house displays a sign offering lavender oil, like tomatoes on Maryland’s Eastern Shore. The traffic was even less on this road, I saw more cyclists than cars. Sault itself is a pretty, hilltop town – meaning a climb into it. 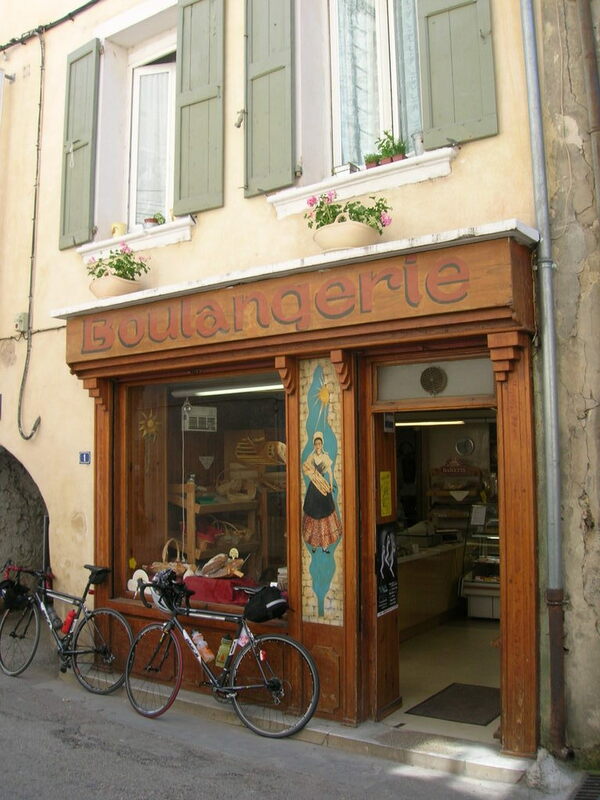 In the village square I found a great patisserie (as usual!) to refuel and control. As I sat in the square a large group of women cyclists passed, perhaps there was a women’s event since I saw many riding that day. The day had kind of gotten away from me, what with stopping to take so many pictures and shop for souvenirs, so now it was almost 5. The steepest part of the climb from Sault is the beginning, unusually, and of course I was stiff from the stop. As I climbed the sun sank lower and lower against the mountain. I began to get nervous, usually the later you get in the day on a mountain the more risk there is of bad weather. When I emerged from the trees at Chalet Reynard the sky was still completely clear though, but a definite chill was falling. From here the climb is the on the D974 from Bedoin, our route for the first climb. It was a very different scene now, only one other cyclist to be seen, and almost no cars. It was a little spooky actually, made me want to get it over and head down. After a seeming long time I reached the summit and hurried to pull on clothes. Fortunately a car pulled in right behind me as the gift shop and restaurant were closed. The driver signed my brevet card and noted the temp was 7C (45F) but it felt colder. I had plenty of clothes so it was not uncomfortable, but I really wanted to get back down to ‘town’. A mountain top is not an hospitable place as night approaches! As I headed out there was a beautiful sight, to the west the line of the Rhone was shining like a golden ribbon in the haze of the distance. On the descent I achieved a true milestone of bad navigation. There is only one paved turn off on the mountain, the road to Sault I had just climbed. The intersection is on a hairpin turn however, amid the parking for Chalet Reynard which creates a wide, unmarked area of pavement. Sure enough, I ended up on the way to Sault and did not notice for over a mile! Fuming I hustled back to the main road and headed back to Bedoin. It is a fantastic descent, long stretches near 10%, fresh pavement for much of the way, and few turns. It was great to get back to the car, the time was near 7 and I was getting hungry. Troy had pizza waiting, and a big bottle of water which really hit the spot. 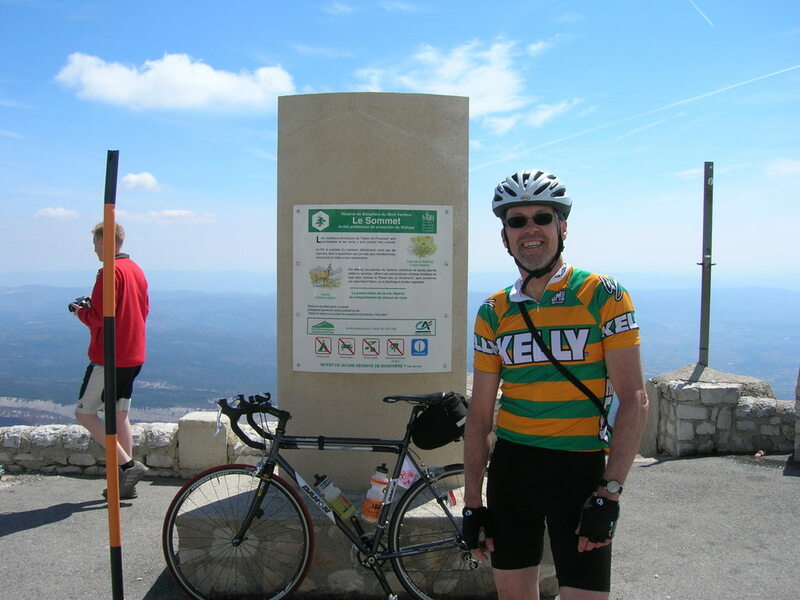 So ended my great adventure on Mont Ventoux, but the rest of the trip was wonderful, touring Provence. The French were unfailingly friendly and helpful to clueless Americans, of course the food and wine was fantastic. I highly recommend it! It is a good quote but those weren’t Simpson’s last words. They were created by a journalist.